The #Infinit8Iniesta jersey, on sale now! A special, commemorative jersey honoring the Barça midfielder Andrés Iniesta went on sale Monday, the Club has announced. 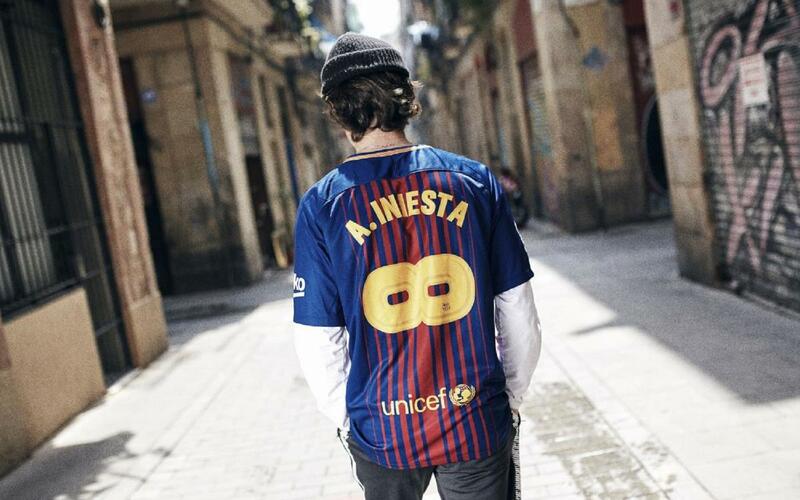 This one-of-a-kind jersey, which features a sideways 8, is the perfect way for Barça fans everywhere to have their very own keepsake in honor of Iniesta, who is leaving the Club at the end of the season. Iniesta recently announced, during an emotional press conference on April 27th, that he was moving on following 22 years at FC Barcelona. The final farewell is being held this Sunday, when Barça welcomes Real Sociedad to Camp Nou for the final game of the 2017/18 season. There will be plenty of pre-game activities outside the stadium, as well as a stadium-wide mosaic moments before kickoff. After the game, Iniesta will say goodbye to the fans as part of a special celebration commemorating this season’s domestic double. Two days before the match, this Friday night, FC Barcelona is holding a private, institutional farewell at Camp Nou, beginning at 9.30pm CEST. The ceremony will be attended by Club President, Josep Maria Bartomeu, Board Members, the players, coaches, Club executives, and other friends, family members, personalities, and invitees. This special farewell ceremony will be streamed live on Barça TV, BarçaVideo, YouTube, and Facebook.